COREparTM 80 USB produces a full spectrum of light with the unsurpassed color mixing of COB (Chip-on-Board) technology and includes a separate magnetic lens to provide the ﬂexibility to go from an ultra-wide wash to a narrow beam in seconds. Rockville PBL30 portable Bluetooth speaker with built-in LED touch-lamp! 2" inch driver built in with long excursion for deep hard hitting bass! 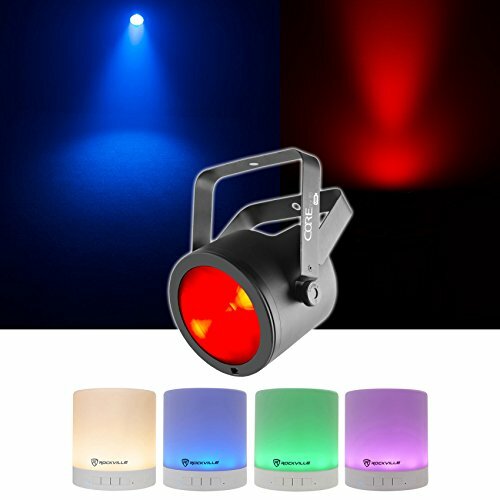 Shipping Dimensions (Inches): 5.91" x 5.91" x 6.89"
Chauvet DJ Core Par 80 USB 80W Stage Par Light Effects COREPAR40 FX+D-Fi USB. COB (Chip-on-Board) LED produces a full spectrum of light with unsurpassed color mixing. D-FiTM USB compatibility for wireless Master/Slave or DMX control. Included magnetic Fresnel lens allows the flexibility to go from ultra-wide to narrow beam in seconds. Withstand the harshness of traveling from gig to gig with a robust housing.